Uncertain future stares at Yemen and the danger of the country sliding into a total civil war remains high even after the Gulf Cooperation Council (GCC) agreement to make President Ali Abdullah Saleh to leave the scene by handing over power to the vice president without any fear of prosecution for his gory deeds over 33 years. Yemen is already a failed state and has been acknowledged as one of the most dangerous of its kind. Yemen’s stockpile of weapons official and unofficial is dangerously huge. The number of uncontrolled weapons is four times larger than the number of weapons in the hands of the security forces. Saleh ruled through a complex system of patronage and fear, not as a snake charmer but literally dancing on the heads of snakes. He managed internal threats like the separatist planks in the south and the Shiite Houthi revolt in the north. How his successor will fare is a million dollar question just as when he would actually step down remains a hundred thousand dollar doubt. Even before the ink on the GCC agreement signed on Nov 23 dried, pro Saleh faction took the streets of capital Sana’a to denounce the deal while the opposition demonstrated its relief and happiness with unconcealed glee. The ensuing clashes claimed five lives. At least 41 were injured, including 27 from gunshot wounds. 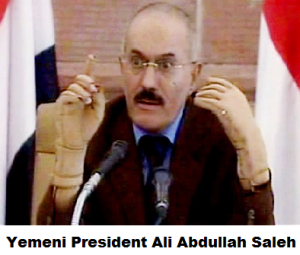 As Peter Symonds says, the GCC agreement by no means guarantees that Saleh will leave office. On at least three occasions he had publicly pledged to quit, only to renege. Moreover, under the arrangement, Saleh will retain a ceremonial role as president even after he has formally handed his powers to Vice President Abed Rabbo Mansour Hadi within 30 days. Presidential elections are due within three months. These are tall claims. Only time can verify their veracity. The point of interest for the present will be focused on Vice President Hadi, a Saleh appointee himself, as he goes about forming a “national unity” government prior to the presidential election. Hadi, a former army officer, will also head a military committee to oversee the restructuring of the military. There is no guarantee, however, that the changes will end the grip of the Saleh family over the country’s military and security apparatus. Saleh’s son, Ahmed, commands the elite Republican Guard, which has been gunning down protesters and fighting street battles in Sana’a against rebel troops and tribal fighters. Three of Saleh’s nephews hold key security and intelligence posts. Under the agreement, Saleh will remain leader of the ruling General People’s Congress, which has an overwhelming majority in the country’s parliament. Elections scheduled for April 2009 were postponed for two years. The government also cancelled elections in April this year, using the anti-government protests as a pretext. No new parliamentary elections are planned until a review of the constitution takes place. Going by reports, it appears the youth, who have been leading the anti-government protests, are not impressed by the GCC deal. They are indeed angry if the angry march along Zubairy Street in the capital’s centre on Nov 24 is taken as the bench mark of public dismay. They chanted, “Our revolution will continue, so beware Saleh” and “No immunity for the murderers.” Some held up photos of those killed in previous demonstrations. The Islah party is part of the opposition Joint Meeting Parties (JMP), which countersigned the GCC agreement in Riyadh and expects to hold posts in the proposed “unity” government. The Islah lead opposition coalition includes Islamists, Socialists, and Nasserite. An overwhelming majority of the protesters in the streets are from Islah ranks. If the present spate of protests gain momentum, sections of workers and oppressed rural people may join the campaign giving it a new dimension altogether. Yemen is the most impoverished of the Arab countries, with 42 percent of the population living on less than $US2 a day. The appeal was not directed so much to the young demonstrators but to Major General Ali Mohsen, who defected to the opposition with his troops, and the leaders of powerful Ahmar clan, who have also mobilized their fighters. These opposition figures, who control the northern and western suburbs of Sana’a, have yet to respond to the signing of the GCC agreement. If Mohsen can be persuaded to abide by the deal, the anti-government protesters in Change Square would be more vulnerable. His troops have provided a measure of protection for the protests from attack. If the young demonstrators cannot be pressured to end their opposition, the “national unity” government will have to turn to the security forces. One expert with pronounced anti-American views avers that US backing for the GCC agreement has nothing to do with supporting the democratic rights of the Yemeni people. ‘Like in Libya, Iraq and Afghanistan, here in Yemen also the Obama administration is concerned to install a regime that will protect American interests and wage its covert war in Yemen against member of Al Qaeda in the Arabian Peninsula (AQAP)’. There is no denying that al-Qaeda has expanded its reach in Yemen, making the local off-shoot, the most dangerous of al-Qaeda’s many franchises. Zinjibar, a port city in the Gulf of Aden is under its influence. Anarchy will give it the cover to carry out deadly attacks and even hamper the freedom of shipping in the Bab El Mandeb Straits, through which more than 3 million barrels of oil pass through every day. Yemen borders Saudi Arabia, and is adjacent to strategic shipping lanes into the Red Sea and the Suez Canal. Yemenis struggle is akin to the Tahrir Square outburst in Egypt. And like in Cairo, in Sana’a too, the struggle for change is far from over. Whoever comes to power ultimately, will have to grapple with a bleak economic situation. Years of misrule and cronyism are compounded by losses in oil export revenue estimated at $10 billion. This entry was posted in News and tagged Ali Abdullah Saleh, AQAP, GCC, General People’s Congress, Tahrir Square. Bookmark the permalink.